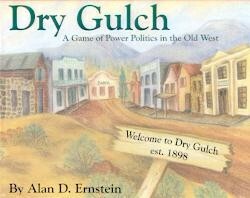 Welcome to Dry Gulch, a bustling new town in the Old West. Players civilize the place by amassing enough power to be "elected" mayor. Power is gained by constructing buildings and enhancing them to improve the quality of life in Dry Gulch. Cope with shootouts on Main Stree, posses amuck in town, fires, and bank robberies - as invoked by the Event Cards - while also gathering commodities and skills - as represented on the Resource Cards. Be the first to control enough "Power Points" and win the game. The board is a plan of the town with a brand new City Hall and homes for each settling family. Each turn, players must deal with two random events. Players then draw either Resource Cards or Building Permits. Resource Cards are the town's currency and are either commodities such as masonry or blacksmithing. Collect the cards that match the construction costs of a building and up it goes! Players earn Power Points equal to the value of each building erected and earn rewards in the form of additional Resource Cards for each site they develop. Each time a building is consturcted players place markers, representing people, on the board so that as the town grows its population increases. And by the time that Dry Gulch has grown into a full-fledged Old West boomtown, someone will have won the game!